The teen fashion retailer, under fire for giving workers a day’s notice they would lose their jobs, finally issued a statement on the layoffs this morning. 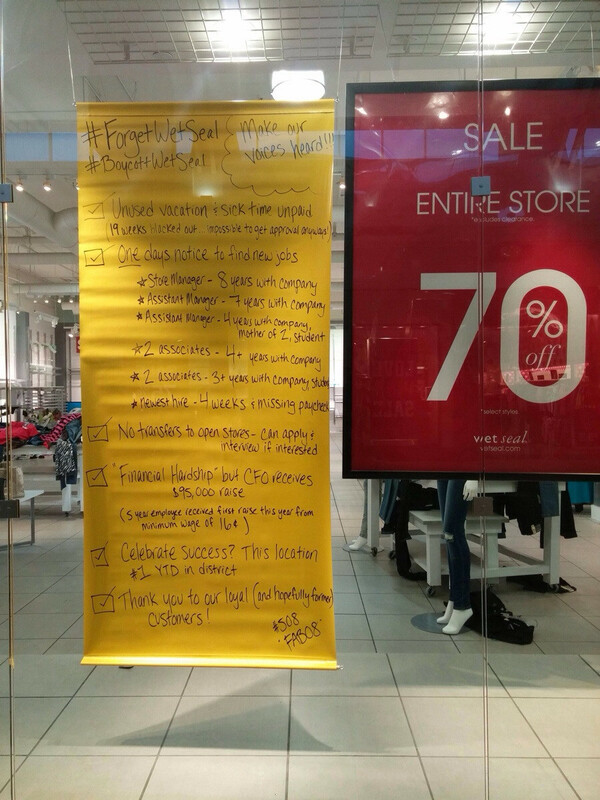 Wet Seal said its severance and “one-time termination” costs will be about $ 700,000. The company has also been criticized for giving its CFO a nearly $ 100,000 raise the day the layoffs were communicated to store managers. FOOTHILL RANCH, Calif.–(BUSINESS WIRE)– The Wet Seal, Inc. (Nasdaq: WTSL, the “Company”), a leading specialty retailer to young women, today announced that it was closing 338 retail stores effective on or about January 7, 2015. The Company decided to proceed with the store closures after assessing its overall financial condition and the Company's inability to successfully negotiate meaningful concessions from its landlords. The store closures unfortunately resulted in the termination of approximately 3,695 full and part-time employees. The Company estimates that the 338 retail stores which were closed represented approximately 48 percent of its net sales for the nine months ending on November 1, 2014. Following the store closures, the Company expects to operate approximately 173 retail stores and its Internet business. In connection with the Store Closures, the Company expects to incur estimated pre-tax charges ranging from an aggregate of $ 5.4 million to $ 6.4 million, including costs associated with inventory write-off, asset impairments and employee terminations. Charges associated with inventory write-off are estimated to range from $ 2.5 million to $ 3.5 million. Charges associated with asset impairments (consisting primarily of write-offs of fixtures, furniture and equipment at the impacted stores) are estimated to be approximately $ 2.2 million. Charges associated with employee severance and other one-time termination costs arising from the Store Closures are estimated to be approximately $ 0.7 million. Such estimates do not include any claims or demands which may be made by the landlords of the impacted stores for unpaid rent or otherwise. The above charges are estimates and the actual charges may vary materially based on various factors, some of which may be beyond the Company's control. See “Safe Harbor Statement Under the Private Securities Litigation Reform Act of 1995” below.